Day 272, deOccupy Honolulu. In a midnight raid, Honolulu police and City crews descended on the deOccupy Honolulu encampment on the corner of Ward and Beretania to seize artwork created for this past weekendʻs "Off Art After Dark" event and Sundayʻs "La Hoʻihoʻi Ea," the commemoration of the return of sovereignty to the Hawaiian nation on July 31, 1843. 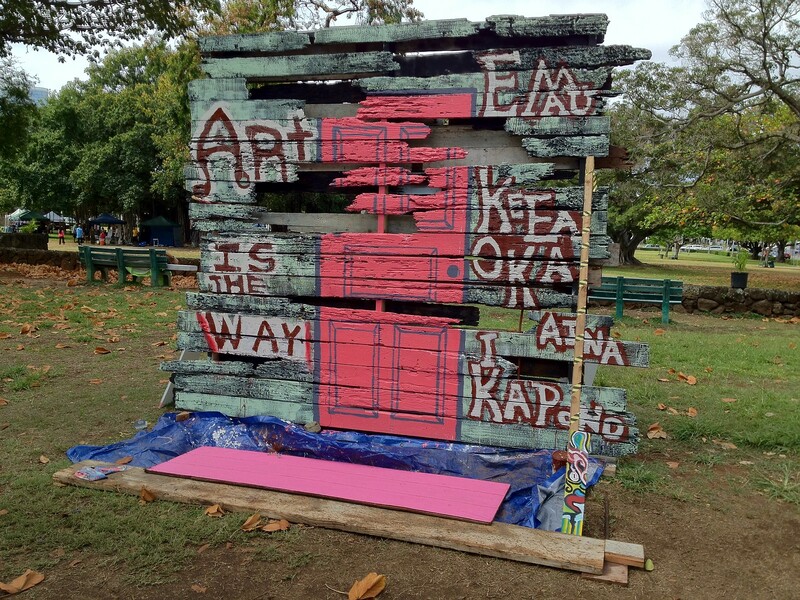 The main installation, an art wall, was painted with the words, "E mau ke ea o ka aina i ka pono," in solidarity with Sundayʻs La Hoʻihoʻi Ea commemoration of the return of sovereignty to the Hawaiian nation. The other side of the wall featured works by #STanigawa. These paintings -- many of them political statements -- were seized and destroyed on site. The area of the installation is directly across the sidewalk from the encampment, and not within the walled park boundaries. Armed police were used to keep deOccupy Honolulu residents from saving the artwork. Many of the #STanigawa pieces in this flickr set were destroyed. (De)Occupy Honolulu is in solidarity with Occupy Wall Street and the worldwide Occupy Movement which asserts that a democratic government derives its just power from the people, but corporations do not seek consent to extract wealth from the people and the Earth; and that no true democracy is attainable when the process is determined by economic power. They urge people to exercise the right to peaceably assemble, occupy public space, create a process to address the problems we face, and generate solutions accessible to everyone. Hey Doug, Please give Sam my love. I presume that it might be an incredibly difficult time, esp. to see her creations destroyed, like this. I miss her, and hold her in the Light.